Here’s a note that BC FORUM Director Millie Canessa received after helping a University of Victoria student with a history project…. I would like to thank you for taking the time to help me with my student project. I really enjoyed speaking to you, and learning about your life. I really admire your determination, and your compassion, and I am very grateful for your contributions to the labour movement, which have improved the lives of B.C. residents in so many ways. You are a wonderful role model for my generation. I really appreciate all your time and effort. It is wonderful to know that people like you, and organizations such as B.C. Forum are working every day to protect the rights of all citizens. Please don't ever hesitate to contact me if I can be of any assistance to you. 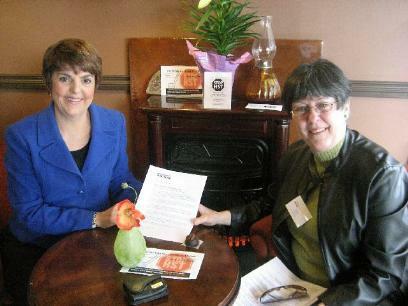 Lynda Zorn, BC FORUM's delegate to the North Okanagan Labour Council, met with BC NDP Leader Carole James March 27 to discuss opposition to the HST and the BC Utilities Commission's approval of a 75 percent increase in the price of natural gas, plus a 12.5 percent increase in delivery charges for Terasen Gas customers in Kelowna. Zorn later joined James at a town hall meeting where the crowd joined Zorn in chanting "I hate the HST." Good afternoon. My name is Lynda Zorn and I am a Senior. And I HATE the HST! HST is an acronym for HORRIBLE STUPID TAX! (My grandson would say, “Gramma, ‘stupid’s a bad word.”) Well, this is a bad tax. And I HATE the HST! The BC Utilities Commission (BCUC), whose members are appointed, are supposed to regulate utilites prices. Yet nine months after approving an increase to Terasen Gas customers in Kelowna, they approved yet another 75% increase in gas prices for us effective January 1st. 75%. Outrageous! What does that have to do with the HST? Well the price of your gas consumption is only 1/3 to 1/2 your total bill. Add to that the additional 12.5% increase they were allowed in delivery charges, then the Franchise Fee, and the Liberal’s Clean Energy Levy, (called the Innovative Clean Energy Fund Levy on your electric bill – boy, this government is innovative) and the Liberal’s Carbon Tax, and the GST - all a percentage of the total. Now you can add another 7% for the HST. I HATE the HST. Now, seniors don’t have great circulation. And here I was this winter with cold blue hands setting the daytime thermostat to 18, and wearing arctic fleece to bed at 15 degrees erroneously thinking I was saving money when it’s all going to taxes. However, I am a green person – I ride my bike everywhere most of the year – and even those will get the HST – and was seriously considering some energy retrofits, but that too will be subject to the HST. I am a Senior and I HATE the HST! Yesterday, I stocked up on the calcium and Vitamin D that seniors are supposed to take for their old bones, because those too, will soon be subject to the HST. I am a Senior and I HATE the HST! As we have done all our lives, seniors are willing to pay their fair share of taxes for services. But the HST is not a fair tax. I am the regional delegate for the BC Federation of Retired Union Members or BC FORUM (great website for HST info - bcforum.ca) and I asked head office what they felt was the best example of this inequity. This is their answer. This government urged residential care facilities to contract out maintenance and care services. Those that did will now pay HST on those contracts. The BC Care Providers Association estimates the HST will cost a 100 bed facility $210,000 per year – the equivalent of 4-5 staff positions. I am a Senior and I HATE the HST! HORRIBLE STUPID TAX! You know the old saying about there’s only 2 things for sure in life – death and ---- the HST - because now funeral services are subject to that additional 7%. Even dying costs more. My name is Lynda Zorn. I am a Senior and I HATE the HST! According to the article “Popular Seniors’ programs coming to an end next week” in the March 10, 2010 issue of the Langley Times, the Gordon Campbell government has again made cuts to seniors programs, such as funding to the Langley Seniors Centre. Langley’s Seniors Centre has for many years provided excellent programs and services to vulnerable senior citizens who can no longer manage some personal needs on their own, and have come to rely on services provided by the Centre and its outstanding community volunteers. We should never lose sight of the fact that these seniors are among those Canadians who struggled to build this nation we proudly know as Canada. It is often said, “We get the governments we deserve”, and it’s true, when we choose to ignore the opportunity to oppose poorly though out government legislation and policy decisions. Seniors deserve consideration from a government whose salaries and benefits are paid by British Columbia taxpayers. Perhaps this decision by our Provincial Government was necessitated by need to reduce the provincial deficit, and help recover the cost of those free Olympic tickets provided to MLA’s and their political masters. I am not surprised by the Campbell government’s decision to cut funding to the Langley Seniors’ Centre, as I recall that this is the same government that in 2002, with the stroke of a pen, cancelled my health care benefits, twenty years after my retirement. Kelowna – The B.C. Public Utilities Commission (BCUC), whose mission, according to their website, “is to ensure that ratepayers receive… services at fair rates from the utilities it regulates,” has allowed Terasen Gas to increase its (Midstream) Commodity charges to Kelowna customers an outrageous 75%, says Lynda Zorn, North Okanagan spokesperson for the BC Federation of Retired Union Members (BC FORUM). “It has also approved a 12.5% increase in delivery charges for Terasen Gas, and the 6% hike Fortis BC implemented and which the City of Kelowna will pass along to its utility customers, and is now considering BC Hydro’s application for a 9% increase, which I have no doubt will also slide through,” said Ms. Zorn. “Add to that the Liberal’s Clean Energy Levy, Carbon Tax, Innovative Clean Energy Fund Levy, Franchise Fee, and the GST, soon to be HST, all a percentage of the total of all the other charges, and you are almost tripling the cost of energy you actually use – hardly an incentive to conserve”, she said. “Don’t think for a moment that these ‘costs’ are not passed on to the utilities’ customers. Further, is this dealing at arm’s length or is it a conflict of interest,” she asks. Thank you for your message of hope, passion and sincerity, for a new beginning toward peace and stability in your America and my Canada. Your Administration is faced with finding solutions to the major financial, social and economic problems, at the most challenging time in world history. You stated during your Inauguration, “We must join and work together toward resolving urgent matters such as world conflict, world poverty, housing, improved and affordable health care for all citizens, and equal opportunity and social justice for all”. As a Canadian I am proud of Canada’s publicly funded not-for-profit Medicare system that is determined by need, not on the ability to pay. As a child suffering a serious illness, I spent several years in hospital, prior to the introduction of Canada’s Medicare system. My family suffered shame and humiliation because they could not pay for my care and treatment, during lengthy periods of unemployment and the economics of the 1930’s depression years. Fortunately, that changed for all Canadians with the introduction of Medicare. I am dismayed and offended by so many critics in the United States and Canada that mislead the American people regarding the facts and benefits of Canadian healthcare. Yes, Canada’s Medicare system requires review and updating from time to time, however no citizen can be denied treatment, based on ability to pay. I trust your Administration is seriously committed to introducing a much improved healthcare system for all Americans. Mr. President, stay the course in your desire and determination to providing solutions to the many problems facing the United States of America. I sincerely hope your Administration’s decisions will lend support to all nations seeking freedom, peace and prosperity.